Why join MTF 2018 in Nakhon Phanom? MTF 2018 is hosted by the Ministry of Tourism of Sports of Thailand (MoTS), in Nakhon Phanom Province, with support from the Provincial Government of Nakhon Phanom, the MoTS Office in Nakhon Phanom, Tourism Authority of Thailand Nakhon Phanom Office, and the Nakhon Phanom Chamber of Commerce. 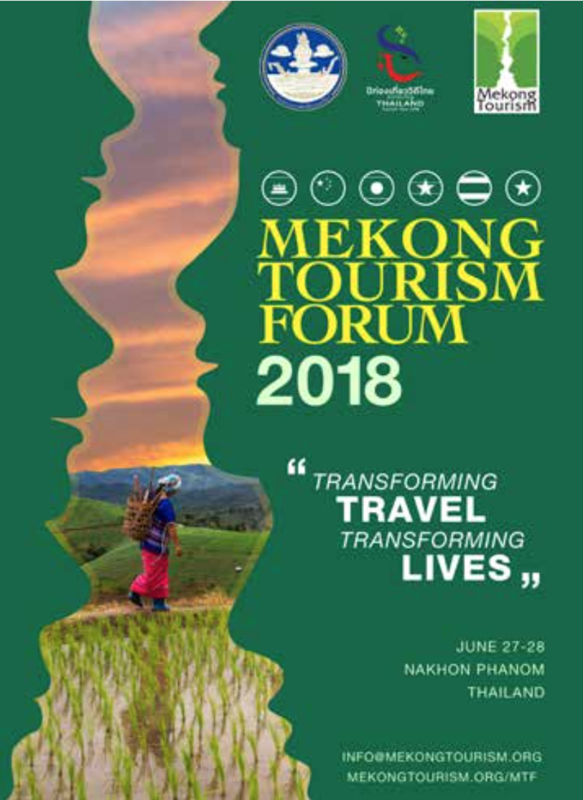 The secretariat of the Mekong Tourism Working Group, the Mekong Tourism Coordinating Office (MTCO) is coordinating the organization of MTF 2018 and related events. 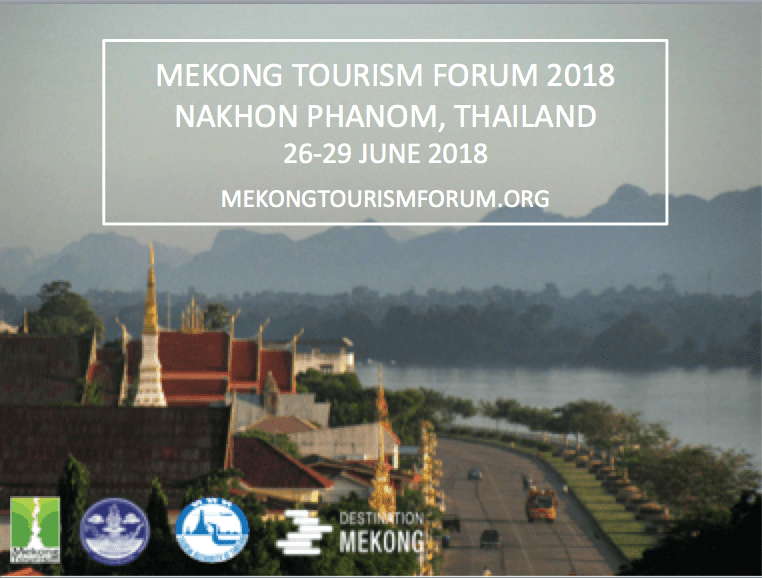 The MTF 2018 event program and concept is created and produced by the public-private partnership framework Destination Mekong. MTF 2018 continues its objective from MTF 2017 to be inclusive and experiential. Similar as in Luang Prabang, where almost 50 travel operators were part in making the destination the venue, in Nakhon Phanom at MTF 2018, the destination will again be the venue. MTF 2018 will introduce the theme “Transforming Travel – Transforming Lives” to open participants’ and hosts’ minds alike by connecting and learning from each other. Tourism can be an important catalyst in changing people’s lives for the better through mutual understanding. By visiting each other’s communities and exchanging ideas, the world can be a better place, and travel can be a force for good. The theme of “Transforming Travel – Transforming Lives” will kick-of its discussion with a half-day “International Conference on Buddhist Tourism”, as well as launch of the Mekong Trends Report on Responsible Travel. With MTF 2018, we don’t just want to attach a theme to the annual forum, but we want to live it. By visiting and engaging with the local communities in the eight ethnic tribal villages, the delegates will be able to interact with the local people, while the local people will be able to interact with visitors from all over the world. Normally, these engagements are staged for tourist purposes, however we would like to engage in true cultural interaction. As such, MTF 2018 embraces the theme “Transforming Travel – Transforming Lives” by experimenting with a new conference theme of hosting the actual sessions together with the local communities in their ethnic villages, and have the local people participate and be part of the experience. That way, we believe the discussions can be enriched, and the experience be a memorable one. In the morning, inspiring keynotes from different sectors in the tourism eco-system explore the theme of Transformative Travel in 15-min creative and engaging speeches followed by our second edition of Mekong Opportunities & Threats, where Mekong Citizens working in travel and tourism in the region make the passionate plea about the importance of their respective area as it relates to responsible and sustainable tourism development in the GMS. From Nakhon Phnom University, delegates dressed in the respective traditional shirts of each village will be transported by van to their respective ethnic village. In the afternoon, eight ethnic villages in and around Nakhon Phanom host eight thematic sessions, from food tourism, adventure tourism, wellness tourism, luxury tourism, religious tourism, community-based tourism, heritage & culture tourism, and meetings & events. Each of the sessions will discuss key pillars in positioning the GMS for these market segments, from experience and product development, accessibility, positioning, accessibility, infrastructure development, human resources development, and investment. Each of the eight tribes has a different feel, and will engage with delegates in discussions. Following a traditional local lunch hosted by the villages, delegates will engage in their thematic session, facilitated by a subject matter expert. After the session, the delegates will explore the ethnic village and immerse themselves in activities to farming to silk weaving. The Mekong Tourism Village Experience promises to be an exciting and pioneering MICE model. Delegates will pay Thai Baht 1,200 to participate in the Village Experience, and will receive a limited edition traditional shirt from their respective village. The money goes directly to the village to support specific projects. Like last year, MTF 2018 will ban single use plastic bottles, plastic straws, and plastic bags. Water refill stations will be available at the main venue, official hotels, and the ethnic villages. Please contact us if you would like to print the official MTF 2087 flyer to promote the event. What’s happening this MTF 2018? “The International Conference on Buddhist Tourism” will kick-of the MTF 2018. Mekong Innovative Startups in Tourism (MIST) initiative will host the “Travel Startup Conference”. The Mekong Tourism Forum 2018 Official Opening Ceremony, presided by the Minister of Tourism & Sports of Thailand and the Governor of Nakhon Phanom Province will celebrate successful tourism collaboration in the GMS. The Mekong Tourism Forum 2018 Gala Dinner will follow the Opening Ceremony with local delicacies, traditional performances, as well as the unveiling of the 2018 Experience Mekong Collection Showcases. Mekong Innovative Startups in Tourism (MIST) will showcase travel startup pitches in front of a jury of industry experts. Anybody is invited to listen and get inspired. Mekong Mini Movie Festival will introduce the first Film & Destination Marketing Conference. In the evening, Hollywood will come to the Mekong Region with the Mekong Mini Movie Festival final screening followed by the Mekong Mini Movie Festival Awards Ceremony. The Mekong Tourism Village Experience is living the theme of “Transforming Travel – Transforming Lives” by being the first conference to stage actual conference session in ethnic community-based villages, and engaging both delegates and villagers together for a uniquely immersive and transformative experience. The pioneering concept allows for people from different walks of life to connect and learn from each other. Eight thematic sessions in eight ethnic villages, including a warm village welcome, a traditional lunch, engaging sessions, and interactive village activities from weaving to farming, will make this a true highlight of MTF 2018. Interested delegates will pay Thai Baht 1,200 each, which includes a limited edition traditional village shirt from the respective village, that is required to be worn for the sessions. Each village is unique, and no experience will be the same. The Mekong Tourism Forum 2018 Food Festival will bring together Thai, Lao, and Vietnamese food, and enough material for engaging conversations, with delegates wearing their villages shirts. Local restaurants will cook their specialities to show the power of food as a fabric of experiential and creative tourism. Range of half-day to multi-day post-MTF technical tours to experience Nakhon Phanom’s unique tourism offerings..
Limited Space Available! MTF 2018 is free to attend for qualified industry professionals – except the Mekong Tourism Village Experience, which requires a fee of Thai Baht of 1,200. Registrations, to be strictly capped at 400, will be on a first-come first-served basis. Registration is open!